A scenic picture taken of Qwest and Safeco Fields which is located in downtown Seattle, Washington. A faint Mt. 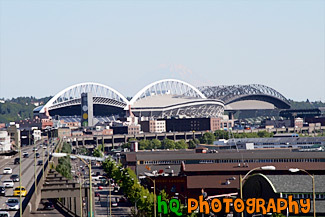 Rainier can see in the background behind the two stadiums. This photo was taken on a sunny blue sky day.